This episode is devoted to roasting, a straightforward and adaptable technique that also works well for meat, fish and chicken. Martha’s roast chicken showcases the benefits of this method, with a crisp exterior and moist interior. 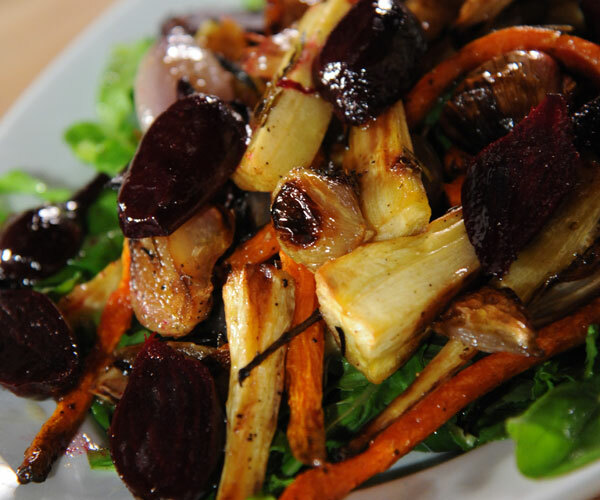 Because roasting so beautifully concentrates the flavors of the ingredients, it’s also well suited to vegetables, and Martha includes a recipe for a delicious roasted root vegetable salad. Finally, she prepares a show-stopping dish fit for any holiday table: a green peppercorn-crusted roast tenderloin of beef. Martha Stewart talks about how to roast vegetables, chicken and meat. Martha Stewart explains how to wash and dry your chicken and why it is important to do so. This herb-roasted potatoes recipe from Martha Stewart is a delicious side dish that does not require great skill to make taste great. Martha Stewart makes this roasted potatoes recipe in the "Roasting" episode of "Martha Stewart's Cooking School." Place a rimmed baking sheet on rack in oven and preheat oven to 450 degrees. Remove heated baking sheet from oven and transfer potatoes to baking sheet, cut sides down. This herb-roasted potato recipe appears in the "Roasting" episode of "Martha Stewart's Cooking School." Visit the episode guide to watch a preview and get a cooking tip.